I have been doing some PCB SMT design using pcb-rnd with a goal of trying a board assembly shop. I’ll do a few prototypes but that is all. Macrofab has enough recommendations for prototype quantities that I have been concentrating on it. Pcb-rnd a spin-off from geda pcb. Geda pcb has stagnated, not dead but somewhat stagnate, so an interested team created pcb-rnd in order to accomplish some significant new features while maintaining backward compatibility to geda pcb. There are numerous YouTube videos about Macrofab HERE. pcb-rnd has significantly diverged from geda-pcb since it was forked, Pcb-rnd has added many more features and uses different file formats, although geda-pcb formats can be imported/exported. It turns out that PnP assembly is tricky as there are NO real industry standards. I’ve tested centroid/xyrs part placement files with several fab houses and each wants a different file format. Likewise each fab company has other peculiarities in its required x/y measurement origin, nomenclature and unit of measure. Additionally, their documentation for “their” format is typically scant to none, ScreamingCircuits being an exception as they have significant documentation. I have been helping Tibor Palinkas (Igor2), the Lead Developer of the pcb-rnd project, on getting pcb-rnd to export a xyrs file that Macrofab can correctly read. It was a challenge but we are finished and pcb-rnd correctly produces a centroid file that has correct rotation and size values. With square/rectangle boards pcb-rnd uses the implicit Pick and Place (P&P) origin of 0;0 at the lower left corner. Pnp-rnd handles the origin used by XYRS with odd shaped boards with a special dot on any layer of the board – a “PnP-Mark”. The PnP-Mark dot is created by drawing a short line and then drag&drop move the endpoint of the unselected mark line back to its origin endpoint – this will result in a zero length line, which looks like a filled circle. Next select the mark, drag&drop move it to the lower left corner of the outline box relative to the outline’s line centerlines, as shown in Figure 2, below. With the mark still selected, press ctrl+e and click on the “add attribute” button in the property editor. Type in “pnp-origin” in the “Attribute key” and “yes” in the “Attribute value” field (see Fig 3 below); click ok and close the property editor. Finally, export the Gerber and xy files. suffixes. Macrofab has a help page that explains their requirements at THIS-LINK. With square/rectangle boards pcb-rnd uses the implicit Pick and Place(P&P) origin of 0;0 at the lower left corner. For odd shaped boards pcb-rnd handles the origin used for XYRS files with a special mark on any layer of the board – a “pnp-origin” Mark. Your part’s footprint and value attributes (Edit→edit_attributes_of→subcircuit) should be meaningful. numbers and values (ohms, etc). Macrofab’s Bill of Materials screen can search parts that are available from component vendors but if your part number is a real manufacturer’s part number and value then the process will go much more smoothly. The pnp-origin dot is created by drawing a short, thin line and then drag&drop move the endpoint of the unselected mark line back to its origin endpoint – this will result in a zero length line, which looks like a small filled circle. With the mark still selected, press ctrl+e and click on the “add attribute”button in the property editor. Type in “pnp-origin” in the “Attribute key” and “yes” in the “Attribute value” field; click ok and then close the property editor. A short video of pnp-origin creation is available at THIS-LINK. When exporting the gerbers (File→Export_Layout→gerber), select checkbox “all-layers” and select name-style “universal”. When exporting the XY file (File→Export_Layout→XY), select “Macrofab” format. Rename the XY file’s suffix to XYRS. Note 1: The pnp-origin mark is not explicitly visible in the XY file nor is it explicitly passed to macrofab. Instead, all part coordinates are calculated considering the mark’s center as 0;0. Make the mark diameter smaller that the router mill bit diameter and place the mark on a copper layer; the board fab will have the copper dot, but it will be milled away. Make a new (copper) layer or unused layer, such as an inside layer, place the mark there and don’t send that layer’s Gerber export to macrofab. pcb-rnd. If your board is created as described above you should have no problems. Macrofab measures x/y placement, in mils, based on the lower left corner of the board or, if present, the lower left corner of the outline centerline. For an example of the proper position, see Figure 2, below. Placement is looking through the board (think X-ray). NOTE that Macrofab uses bounding box measurement so if your board is an odd shape, for example wider at the top than the bottom, the lower-left corner will be that of the bounding box and not necessarily that of the board’s outline. See Figure 1 “Bounding Box PCB Example” below. Macrofab requires the part dimensions, in mils, of the part’s Rotation-0 orientation regardless of the rotation of particular placement. So, a part, measured Rotation-0 orientation, of XSize 366.27, YSize 237.17 would use the same value when in Rotation 90, etc. Macrofab rotation is based upon Dual inline chips being oriented at 0 (zero) rotation with pin one on the upper left. Two pin and single inline components are oriented at 0 (zero) rotation with pin one to the left. See figure below. Also, rotation for the bottom is the same but with the board flipped, bottom now facing you. BTW – some may wonder why I use pcb-rnd or geda pcb instead of kicad (I avoid non-open-source software). I have tried kicad enough to know that it is a very capable product – but – it is too monolithic for me. I prefer the Linux/Unix approach of a tool-suite, which geda pcb and pcb-rnd provide. I have a history with geda pcb, having used it for years – I know it and therefore find it easy to use – but pcb-rnd has many more features than older geda-pcb and is therefore what I use. That said, for a newcomer that has never before used pcb layout software, I would recommend kicad. I love AWK. I am among a minority. While many people use awk one-liners in shell scripts, few utilize awk as it was originally intended – a stand-alone language. I used to use it extensively back in the 1990s and continued to use it as my go-to language whenever I needed some heavy lifting text file manipulation. The note immediately follows the NOTE keyword in field 2. The CONT line that follows is a “continuation” line of the preceeding line. 1 CONC Comments on "Charlie Accented ANSEL" INDIVIDUAL Record. Note @N24@ is the cross reference to the actual note @24@ much later (often near the bottom) in the file. My problem was that, recently, I have been using the genealogy website WikiTree.com and their new GEDCOM import process (GEDCOMpare) has some bugs. Currently it discards cross-linked notes. To resolve this problem I wrote an awk program that converts cross-linked Notes and Sources into In-Line, which mitigates the WikiTree GEDCOM import problem. Now, with the background out of the way – on to the reason for this post. Awk isn’t blindingly fast since it is an interpreted language so a binary executable of the awk program would help with large GEDCOMs. I stumbled across a SourceForge project by Andrew Sumner named “awka” In addition to being hosted on SourceForge it is also hosted by noyesno of Shanghai, China on GitHub. I compiled and installed it with only one issue – it put its library in /usr/local/lib instead of where I needed it for my system – /usr/lib. In one word AWESOME! Awka creates C source that compiles into an executable that is functionally identical to the subject awk script. If you’re into awk check out awka! And if you aren’t into awk – GET INTO AWK! I was watching a YouTube video series about removing and replacing a BGA IC and the talented technician was using a really useful looking PCB holder. You’ll see the PCB holder at 3:50 into the YouTube video link below. The video is in Vietnamese but that doesn’t really matter as you can clearly understand what he is doing. 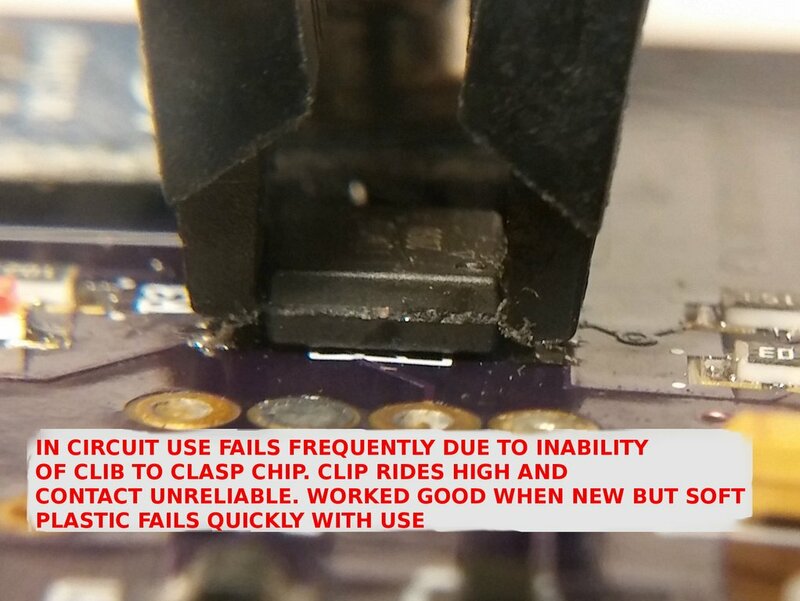 Unfortunately, my first BGA removal was a failure because I was a bit too eager to lift the chip, applied too much pressure and lifted several BGA traces on the PCB. I fear that the board is ruined beyond recovery. I should have first practiced on a junk board. I purchased one of these useful little PCB holder via eBay and it arrived yesterday – see my photo below. It seems well made and I definitely believe that it will be as useful as in the video. The base is a painted steel and the vise parts are plated but show machining marks so they may be machined rather than cast, which is a good thing. The base measures 12cm x 8cm. I purchased mine for $3.41-USD (including shipping) from eBay seller “94racing-us“. It was delivered in twelve days from order. Domestic delivery is often slower than that and this came across the globe from China. I could not get association of a file icon, mime type and application to work satisfactorily. There are numerous how-tos on the Internet but all are incomplete or wrong. The greatest help, for me, was the ARCH Linux Default applications help page. It helped more than any other, but wasn’t all of what I needed. BTW, I couldn’t get the icon to work in the .local directory so I had to put it into ‘/usr/share/icons/Mint-X/mimetypes/scalable/’ in my Mint 17.2 system. I made a Printed Circuit Board (PCB) for a project that I have been working on that a temperature and humidity sensor. My initial PCB had mostly Surface Mount Devices (SMD) parts but three parts were discrete through-hole parts. Through-hole parts are a problem for Pick-aNd-Place (PNP) production, so they should to be replaced by SMD parts, whenever possible – see Design for manufacturability (DFM). One discrete part that I was using was the Chinese made DH22 Temperature & Humidity sensor module, readily available on eBay and elsewhere. The DH22 works fine but being discrete, it had to go. The sensor IC that I selected is the Silicon Labs Si7006. The Si7006 interfaces via two-wire I2C. The final target controller chip is my personal favorite, the Atmel/Microchip Attiny85. However, I have a good bit of experimentation to do before it will be ready for the Attiny85. Until then, I am experimenting with the Arduino NANO. I don’t plan on integrating the Si7006 into my total PCB design until it is working to my satisfaction. Consequentially, I designed a small prototype board (~10X13mm) that I can plug into a breadboard. The schematic for the Si7006 prototype board is shown in Fig. 2, below. The layout of the resultant PCB is shown in Fig 3, below. Today I tested the Si7006 in a breadboard with an Arduino NANO using a test program (Si7006Example) that is part of the thingTronics Si7006 Arduino Library. See Fig 4, below. At first it only partially worked – it started, read the serial number and firmware number but reading the temperature and humidity failed. After some research, I changed the read mode from the default “No Hold Master Mode” to “Hold Master Mode” and it immediately started working. Actually, I also unsoldered the original 10k resistors and replaced them with 4.7k resistors, also due to an interesting article that I read about the Si7006’s pull-up resistors (I’ve lost the link, sorry). With the read mode changed to “Hold Master Mode” the Si7006 prototype board worked correctly. See serial output in Fig 5, below. Next, I need to try interfacing to a resource limited Attiny85 using the TinyWireM library. I expect this to be a challenge. In a current personal(1), i.e., not for sale or distribution, project I have been using a Chinese ASK radio transmitter module – the STX-882, which I posted about back in February of this year. The STX-882 works well BUT being a module, it is a through-hole device and my goal is for my current project to be 100% Surface Mount Technology (SMT). While this project will not be manufactured for sale, I am curious as to what such a device would cost IF it were turn-key manufactured and what the final cost would be. It appears that the cost would be greatly reduced if there are no through-hole devices. Through-hole devices in a low volume product cause a two step manufacturing process where the board is assembled using Pick aNd Place (PNP) fabrication but must be finished by hand. As a result, I needed to replace the three through-hole parts in my design with SMD parts. One part, a large capacitor, I will replace with several, smaller capacity SMD capacitors. However, two modules, a Temperature/Humidity sensor and the aforementioned STX-882 433.92MHz RF transmitter module would need to be replaced with SMT designs that would be incorporated on the same board. I decided to build three small personal prototype boards solely to test my design and fabrication. To replace the 433.92MHz transmitter I selected Microchip’s MICRF113YM6 single-chip ASK Transmitter IC. Quick calculation indicates an ERP of -10.005 dBW with a λ/4 antenna. Transmission time is a few milliseconds. Utilizing a slightly modified version of their reference design I used pcb-rnd PCB design software to design a small prototype board which I then had made by OSHPark. This board was designed VERY quickly – I didn’t spend over 30 minutes designing the schematic and laying out the board. Such is the case with pcb-rnd, which was forked from geda PCB in order to add a number of innovative features. Today, I broke out my 858D hot air workstation and built up one of the prototype RF Transmitter boards. Next I cranked up a breadboard’ed test receiver for this project and on a transmit breadboard for this project I switched out its STX-882 transmitter and substituted my newly designed board. See Fig 3, below. To my great joy, the instant that I powered it up error free data was being delivered over 433.92MHz. Refer to Fig 4, below, and you’ll see the received temperature and humidity data. Also, Fig 4 is a spectrum scan while the radio periodically transmitted data (once per minute). The measured frequency is 433.916 – not quite the 433.92 expected but certainly well within tolerance. I’ll accept it because I didn’t use precision parts for C5 and L2. They are 10% tolerance parts. Fig 4: Data received from Prototype RF Module. Now I’ll move on to testing my prototype temperature/Humidity sensor module. More on that later. 1. This is a personal use home-built device (not kit-constructed) that is assembled in a quantity of five or less. BTW – this odd verbiage is in case anyone from the FCC reads this post. Last April I wrote about the cheap Chinese SOIC-8 test clips. 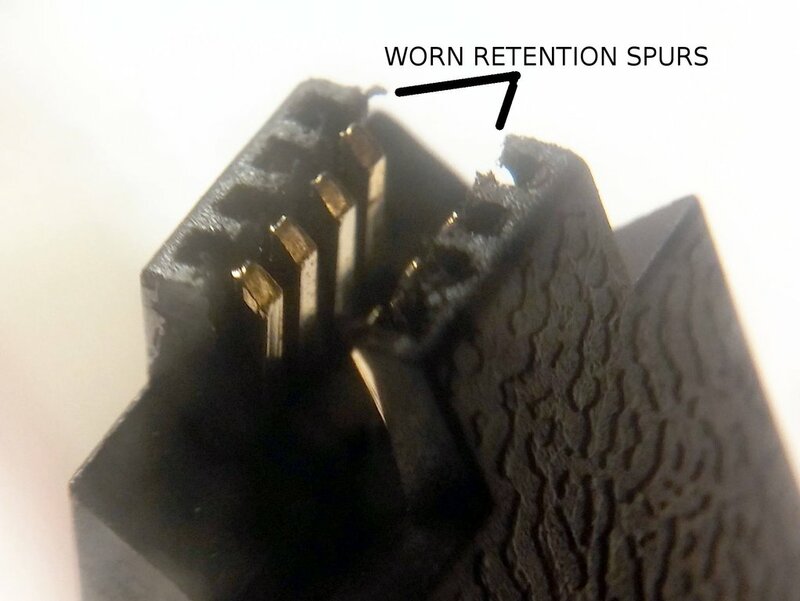 In that post I primarily discussed the wiring – specifically that, as wired, it isn’t useful for in-circuit programming of the ATTiny85 SMD SOIC-8W chip. Ultimately, I rewired the clip so that it would work correctly for the ATTiny85 SMD SOIC-8W chip. I went on to use the chip quite successfully, programming a number of ATTiny85 SMD SOIC-8W chips while in-circuit. I was thinking that this cheap Chinese test clip was pretty good until today. I had extreme difficulty getting it to program in-circuit on one board and this was right after a good program on another board. Since one board programmed successfully I assumed that the second board had a problem and, after a lot of investigative work ended up tearing the board apart piece by piece when the problem was actually in the test clip. With further, magnified, investigation (see photos below) I discovered that (1) the clip rode too high on the chip; (2) slight variation in chip profile made some chips fail when others would work; (3) the culprit was the clip’s retention spurs – little extensions of the plastic part of the clip that are intended to grasp the IC around its base and hold the clip firmly in place with good contact to pin connection. The plastic is simply too soft for the retention spurs to survive very long – I probably used it less than a dozen times before it failed. 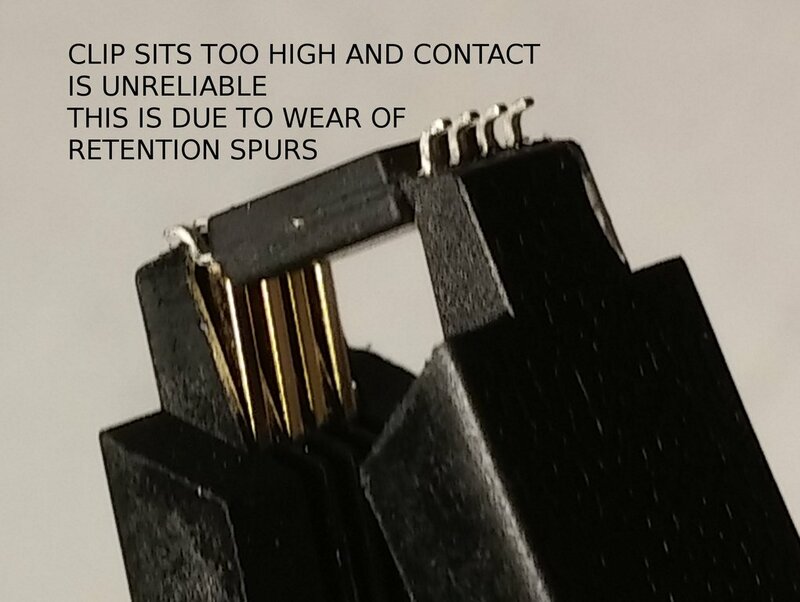 I thought that a better brand of test clip might not have this problem but, after reading THIS ARTICLE and also THIS ARTICLE, it seems that it is a universal problem and that the brand-name clips are no better. I am going to be forced to abandon in-circuit programming using a SOIC-8 test clip and, instead, I’ll design in a programming connector. A 10 or even 6 pin ISP connector is too large for my boards so I may just put in some plated-through holes for pogo pin connection and create a custom programmer cable with the pogo pins secured in a small PCB. TAG-CONNECT cables and pads are one solution but I think that I’ll probably just roll my own. UPDATE: On eBay (seller pingf123) I found and interesting pogo pin adapter for SOIC-8 chips. Unfortunately, its pins are at 5.08mm which is designed for a standard SOIC-8 (SOIC-8-N) and the ATTiny84 SMD package uses a SOIC-8-W (wide) package and this adapter’s pins will not clear the case – so, no good for the ATTiny85. I’ve been wondering if I can 3D print my own pogo-pin adapter? Hmmm – I’ll ponder on that while I wait for my new 3D Build-One printer to arrive. I’ve retired my old OneUp printer as it was getting too loose for good prints. For new designs TINDIE has a pretty neat little Tiny AVR-ISP pogo-pin programming adapter. Also, the solution by Geppetto Electronics on TINDIE looks good. Also, in kit form is the solution by SparkFun – their $10US ISP Pogo Adapter looks like another good solution. UPDATE: to the UPDATE: I was unwilling to wait for the most economical solution – I purchased both a custom version of pingf123’s pogo pin adapter for SOIC-8 chips mentioned above and Geppetto’s TINDE AVR ISP Pogo Adapter kit solution above. Both are good quality solutions – pingf123‘s solution is good when no ISP pad is available and when there is a ISP-type pad Geppetto Electronics on TINDIE does the job. P.S. : pingf123 posted a comment – he made me his adapter at the custom spacing of 7.4mm. See comment section.